Five Mistakes Rescue Dog Owners Make - Caring for a Rescue Dog | Leader of the Pack Home Dog Training | Proudly Serving the Inland Empire.Riverside, Orange and San Bernardino Counties. Dogs, like humans are born with their inherent personalities. That personality is Nature’s “stamp” and like us, a dog is stuck with the personality they’re born with. A confident, willful puppy (barring trauma in a critical period of early development) will be a confident dog just like that kid voted most popular in high school will probably have no problem making friends throughout life. A shy, nervous dog, just as the insecure human struggles their whole life with underlying self-confidence issues. 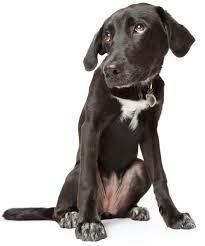 Many rescue dogs enter their new families displaying shyness or even fear. This is NOT necessarily caused by “abuse”, as is routinely assumed. Many times, shy or fearful behaviors are simply manifestations of that particular dog’s personality – he’s just a shy guy. His recent life upheavals of suddenly being taken away from his previous home, finding himself in a noisy kennel and then another change of routine as he was moved again into his “new” home has exacerbated his insecure personality. Have some rescue dogs been abused? Sure. But odds are the rescue dog showing suspect signs of abuse was already a shy guy before he was harshly treated. The abuse simply found a ripe target. I say this because when confident, happy dogs endure the same sorts of harsh treatment, they typically bounce back with little or no emotional damage. In fact, they often come back to kiss and lick the hand that beat them, not to bite it. Rescue dogs have been through a lot. They’ve lost their family, their home and their familiar routine, whatever it was. It’s natural for us to feel sorry for them. Even the term “rescue dog” is emotionally charged to imply that the new owners is “saving” this dog from an environment that was somehow horrible or dangerous. While this may be true, just as many dogs in rescue came from normal families that simply could not care for the dog properly, or for whom the dog was simply an inappropriate match. What a new rescue dog needs is MORE rules, not fewer. MORE structure, not less. They need a new predictable routine and organizational clarity. To feel secure, what a dog needs to know is who’s driving the bus and what his seat assignment is! A carry-over from this feeling sorry for the rescue dog is the tendency to make excuses for his behavior. Excusing a dog that jumps up (he’s just starved for attention), ignores you (he’s just busy exploring his new yard) or failing to take seriously the dog that barks at a family member who enters his room (he’s just jumpy from all he’s been through) or growls at the husband that tries to join his wife and the dog on the sofa (he’s just protecting me) does nothing to help the dog. In fact, it can prolong a rescue dog’s sense of confusion, mask real issues that are surfacing or worse – give the dog an inflated sense of importance that can have disastrous consequences down the road. The first few days of the rescue dog’s new life are crucial. He is looking for the answer to his first and most burning life question: Who’s in charge here, and where do I fit in? If the new owner does not answer clearly by leading at this important juncture and immediately setting and enforcing rules in their household, the dog will deduce that they are not in charge…so he must be. If he is by nature a nervous dog or shy dog, the owner will have promoted him over his pay grade and increase his stress instead of diminishing it. If he is a confident personality, the owner may have fulfilled his delusions of grandeur and created a tyrant. A bad deal either way. 4. Thinking love and socialization will cure everything. A family rescues a dog with aggression issues, thinking the aggression is caused by a lack of socialization and that they will “cure” the dog by socializing him more and loving him through it. If love and socialization could solve every dog problem – trainers like me would be out of business. Instead, we’re busier than ever. Remember Mistake #1? Dogs are who they were born to be. All the love in the universe and all the socialization in the world cannot change the instinctive personality of a dog. That said, love from you and socialization with other dogs can be a really good thing – until or unless it isn’t. IF a dog was born with a tolerant personality but lacks experience with other dogs, socialization can help that personality blossom. If, on the other hand, a dog is born with an instinct to be defensive and aggressive when worried or threatened, socialization won’t change that instinct! In fact, forced socialization may get him hurt. While more positive social situations may raise the dog’s threshold for worry and therefore the frequency of his aggression, he will likely still be defensive when the new threshold is crossed. A dog that has bitten is a dog that may bite again. A dog that has fought in a dog park is a dog that may fight again. Instead of forcing socialization down the throat of the worried or defensive rescue dog, owners can keep their dog happy and calm with traditional activities like walks in the park and fetch in the back yard. Defensive, reactive dogs don’t want activities that make them nervous. They would much rather hang with their family. However, it is possible over time, with proper training, trust and leadership that fear and aggression can diminish greatly. Picking a dog is like picking a spouse. There are a lot of great candidates out there, but a successful relationship depends on choosing the one that’s right for you. The family with children or visiting grandkids should not take a dog that has been fear-aggressive with people. Instead, a better choice would be a rescue dog that is tolerant, but whose wild behavior can be tamed with training. The active, fit single with a strong and confident personality and willingness to commit to a “project”, on the other hand, could take on that rescue dog with personality issues or that needs extensive rehabilitation and training. IT’s all in the match. There’s a special place in Heaven for rescue dog owners. Avoid these five mistakes so life with them doesn’t become a living Hell.